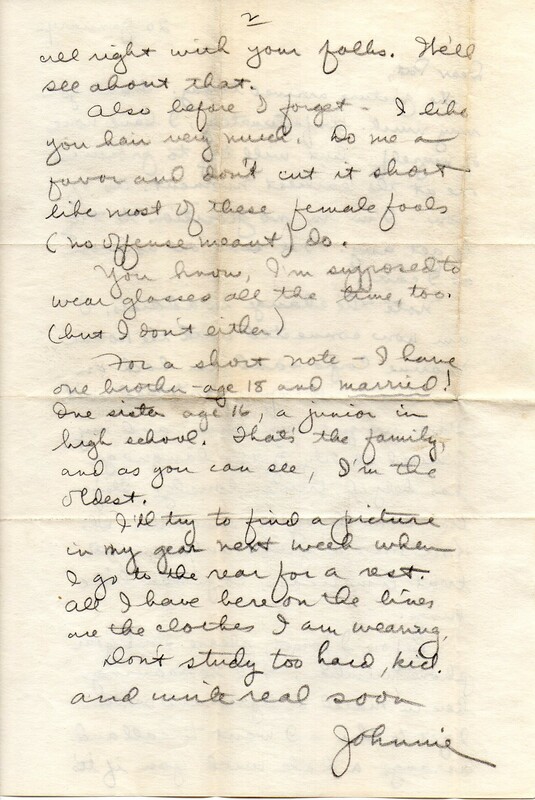 Between the first letter and this letter, it seems my mom sent Johnnie a photo of herself. She was still only 15 years-old. He, as we learn later, was nearly 21. In this letter he describes his family — he talks about his siblings, but doesn’t mention his parents. I did some poking around on FamilySearch.org and found the 1940 census record of a family that matches Johnnie’s. More poking found a death record for an Ida Gannon who was married to an Edward Gannon which match the 1940 census record so it is possible that his mother, at least, was dead at the time of this writing. “I’m not as mad as it looks. 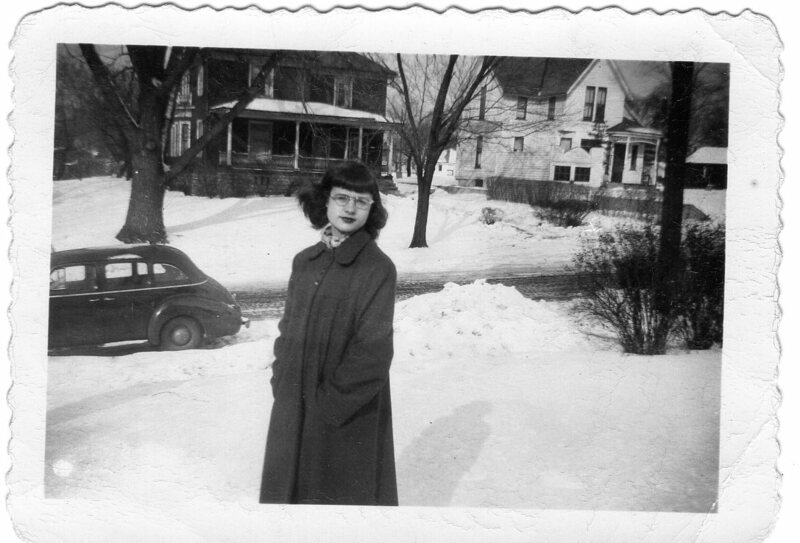 It was windy.” 16, Feb. 1936 (her birthday). Feb 11, 1951. 1936. It is possible she sent Johnnie a copy of this photo — the backwards way of writing the date (to us) makes me think she was copying the way Johnnie wrote the date. The picture arrived today. Thank you very much. Unfortunately I have none of myself – but will try to procure one at the earliest moment. As of now I am in no position to try to get any. I’ll send one as soon as I can. Note the change in address. 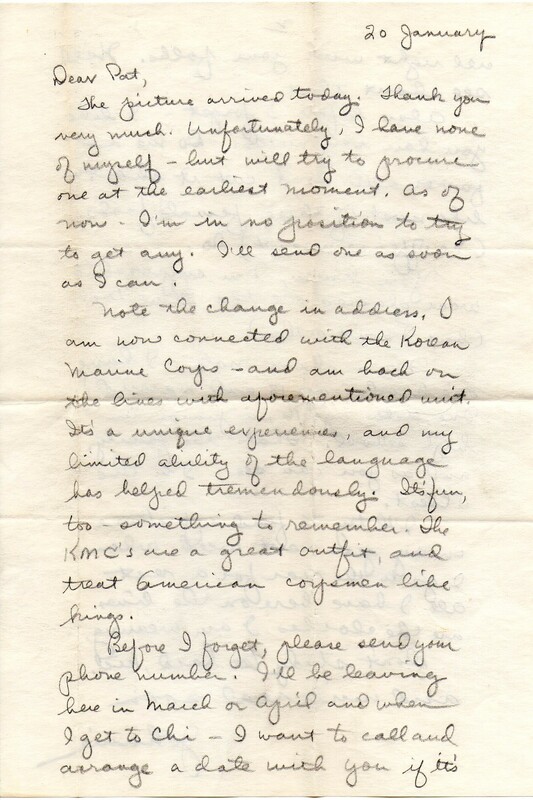 I am now connected with the Korean Marine Corps – and am back on the lines with aforementioned unit. It’s a unique experience and my limited ability of the language has helped tremendously. it’s fun too – something to remember. The KMCs are a great outfit and treat American Corpsmen like kings. Before I forget, please send your phone number. I’ll be leaving here in March or April and when I get to Chi – I want to call and arrange a date with you if it’s all right with your folks. We’ll see about that. Also before I forget – I like your hair very much. Do me a favor and don’t cut it short like most of these female fools (no offense meant) do. For a short note, I have one brother – age 18 and married! One sister age 16, a junior in high school. That’s the family and as you can see, I’m the oldest. I’ll try to find a picture in my gear next week when I go to the rear for a rest. All I have here on the lines are the clothes I am wearing. Don’t study too hard, kid. And write real soon. I am loving these snippets of life and war and young people in the 1950s. It’s fun, isn’t it? Especially for me since my mom was involved. Yeah, me too, IB — although mom was prettier than the photo shows. Again I say I love this. I’m a little obsessed with it now, though. Not good with work deadlines!